Now simply click on the "View or edit your cart" link under the Order Subtotal amount. That will take you to your shopping cart. In the shopping cart you go to the upper right and you'll see a box titled"Coupon Code". Simply enter your coupon code into the box and click on GO. In the example below, the Coupon Code is the word "humidor" in lower case letters. Upon entering the discount Coupon Code and pressing GO, you will see the discount reflected at the bottom of the cart in the section displaying your totals. The amount that was discounted from your order of cigars, humidors and accessories will be shown and you'll have the option of removing the Coupon Code by clicking on the Remove link. Obviously that will remove the discount so it's not recommended. Below it is your Grand Total, which will reflect your Coupon Code savings. Now you can increase or decrease the quantities of each item or PROCEED TO CHECKOUT. 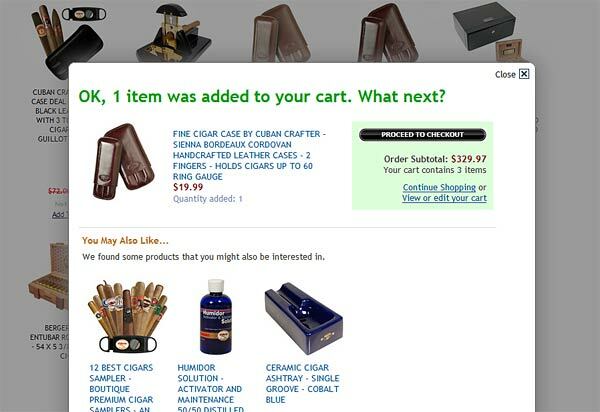 If you would like to add additional items to the shopping cart, you can simply click on any of the category links at the top of the page and it will take you to that category so you can add additional cigars, humidors or cigar accessories. You can then click on Add To Cart for those additional items and you do not have to enter the discount Coupon Code again. It will be remembered, along with the appropriate discount. Happy Savings!